We do two types of Facelifts here at The Esthetics Center of El Dorado Hills: full (traditional) facelifts and mini facelifts. We will discuss the full facelift at the top of this page, and at the bottom of this page we will discuss the mini facelift. The biggest difference between the two is that the full facelift goes deeper than the mini facelift. It actually "lifts" more layers below the skin. Because of this, the results are far more drastic and long-lasting, but the down time is greater as it is more invasive. Both of these procedures are incredibly effective at restoring a youthful look through eliminating wrinkles and sagging neck skin, but depending upon your needs, one may be a better fit than the other. We'd love to schedule a personal consultation with you and help you discover which facelift may be the best fit for you. 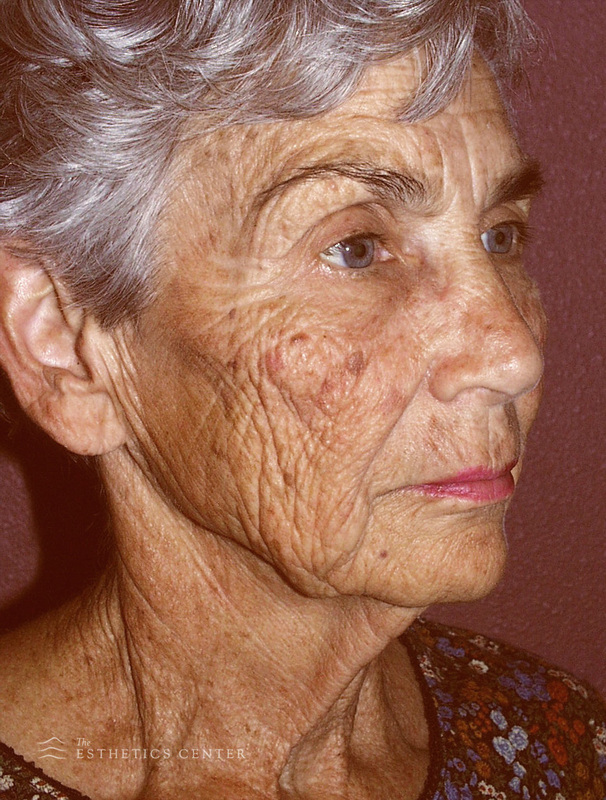 As we age, we can experience a less contoured face than we once had. Thinner skin, sun damage, loss of facial fat, smoking, and stress can all contribute to this lack of a youthful contour. Additionally, we may find sagging skin, deep wrinkles, jowls, a double chin, or other signs of aging as we progress in years. A full facelift (rhytidectomy) is perhaps the most well known of all cosmetic surgeries, and for good reason— full facelifts are incredibly effective at improving the visible signs of aging on the face and neck. This is done by removing excess skin and wrinkles, repositioning fat, and repositioning the facial skin. WHO IS A FULL FACELIFT CANDIDATE? If you have a large number of wrinkles on your face and/or skin that is sagging and causing the appearance of jowls or loose skin on the neck, this procedure is designed to help you. Most of our facelift patients are between the ages of 40 and 70, but patients in their 80’s may also be eligible, as long as there are no conflicting medical issues and the skin still has a level of elasticity. In addition to skin elasticity and overall health, a good facelift candidate is also one who has good bone structure. Having well-defined facial bone structure is important because it offers support for the facial changes that we will make. WHAT DOES THE FULL FACELIFT PROCEDURE ENTAIL? Facelift surgery can take between 3 and 5 hours depending upon the type and extent of the changes required. There are seemingly as many variations to the facelift procedure as there are surgeons, but most of the variations, while important, remain subtle. Typically, we will make incisions that preserve a natural appearance, do not alter the hairline, and are nearly invisible in the creases and contours around the ear, all while enabling important surgical maneuvers. The goal of a well-executed facelift is a natural, more rested you, not a pulled or "windswept" tightness that is too often seen. Each facelift is subtly different and individualized to each person's needs and goals. However, there are common maneuvers that are done to accomplish each lift. This starts with an incision that is typically beneath the temporal tuft (woman's sideburn), or hidden in the hair of the temple, extending into the crease above the ear, down in front of the ear, hidden in additional creases, then beneath and behind the earlobe, onto the back of the ear and then, as needed, curving into the hair-bearing scalp behind the ear. This incision is similar in all of our facelifts as it best hides the scars. Once the incision is made, the deeper layers are approached. A facelift lasts longer when a layer called the "SMAS" is repositioned and tightened. "SMAS" stands for superficial muscular apponeurotic system, and like a girdle that smooths a body but is not seen beneath a dress, it allows for smoothing and tightening that clearly improves the overall contour. The primary difference between a mini-lift and a full facelift is how the SMAS is treated. In a mini-lift, the SMAS is simply tucked and suspended with sutures; whereas in a full facelift, the SMAS is lifted, trimmed and tightened. At the conclusion of the surgery the skin is adjusted, any excess is lifted and trimmed, and then the incisions are closed with fine silk sutures. Often, when neck skin is lax, or neck bands are prominent, an incision will be made under the chin to allow access to smooth and tighten the neck at the same time the jowls and cheeks are lifted. We nearly always further refine the facial and neck contours using liposuction, putting the finishing touch on our facelift procedures. When the surgery is complete the incisions are coated with antibiotic ointment, and the face is dressed with a supportive dressing that encompasses the head and stays in place for the first 1-2 days. Typically patients return the next day, the dressing is removed, the wounds are redressed, and a removable elastic supportive facial garment is put in place and worn for the next few weeks. WHAT IS THE FULL FACELIFT RECOVERY PERIOD? A facelift is a significant surgery; and following the surgery, you can expect swelling, bruising, and some discomfort, but these issues are temporary and pain is rarely a significant issue that cannot be treated with relieving medications. Many of our patients comment that there is significantly less pain than they expected. Wearing your bandages and changing them on a regular basis. No swimming or getting your face wet in the shower. Using a cold compress on the eyes. Because of the bruising and swelling that results from having this surgery, it may take 10-14 days before you are comfortable being seen in public or going back to work. To speed up your recovery, we recommend sleeping with your head elevated for 2 weeks and not wearing makeup until your Esthetics Center surgeon gives you permission. It may take several weeks, or even months, for the swelling to fully subside and for you to enjoy the final results of your facelift, but even as you progress toward seeing your final look, we know you will love what you see! As for the results, it should be noted that a facelift is not a permanent solution to aging, but it can make you look 5, 10, or even 15 years younger. With that said, depending on your age and skin health, your facelift’s effects may last for as long as 10-15 years, or more! A mini-lift surgery is the most common facelift procedure that we perform. A mini-lift has been called a multitude of different names: MACS lift, S-lift, and life-style lift. The mini-lift was designed to eliminate mild to moderate wrinkles and loose skin on the lower third of the face in younger patients. The benefits of the mini-lift, as opposed to the full facelift, are that the mini-lift is less invasive, resulting in less surgery, and therefore less risk and down time. Having said that, it is only appropriate for specific degrees of facial aging. A mini-lift is not appropriate to rejuvenate the face where significant sagging, laxity, jowling, and aging is present. 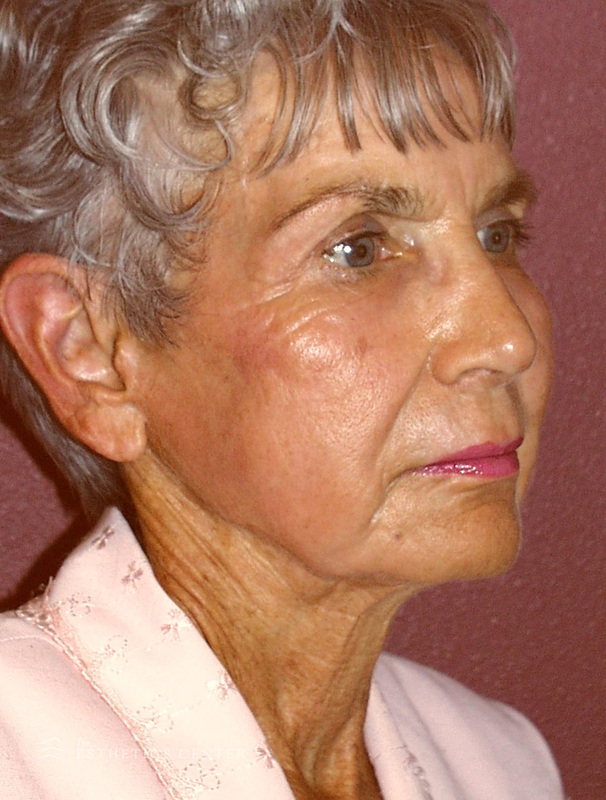 Can a mini-lift be done on a 70 year old with heavy aging about the face? Yes, but the results will be sub-optimal and will not last as long. WHO IS A MINI FACELIFT CANDIDATE? It is said that a person’s age is best guessed by their face. With that said, if you feel that the condition of your face does not accurately portray the way you feel inside, you may be a great candidate for a mini facelift. Furthermore, if your jaw has become less defined with age due to wrinkles, or if you have moderate skin sagging, then the mini facelift may be a great option for you. Typically our mini facelift candidates are between the ages of 40 and 55, but this procedure can be effective for older patients as well, depending on skin elasticity and overall health. WHAT DOES THE MINI FACELIFT PROCEDURE ENTAIL? The mini-lift uses roughly the same incision path as the full facelift, but can sometimes be shorter. As discussed above, the SMAS is the critical structure addressed in facelifting. Remember, "SMAS" stands for superficial muscular apponeurotic system, and like a girdle that smooths a body but is not seen beneath a dress, it allows for smoothing and tightening to improve the overall contour. There is less bruising and swelling. There is less facial change. The effects are shorter lived. The procedure is less invasive due to smaller incisions. Patients are able to resume social and work activities within a day or two. WHAT IS THE MINI FACELIFT RECOVERY PERIOD? The mini facelift’s recovery is much shorter than that of a full facelift. For this reason, it has been nicknamed the “weekend facelift” by many in the industry. While a weekend recovery is not entirely accurate, it is true that many patients are able to return to work within 7-10 days after their surgery. The mini facelift procedure is an outpatient surgery. Following the surgery, you can expect swelling, bruising, sensitivity, and a temporary sensation loss. There will be some discomfort in the face—this is to be expected. We advise sleeping with your head elevated at a 30 degree angle in order to minimize facial swelling. We will also prescribe pain medication to help you handle any pain caused by the surgery. When it comes to activities, you can expect to be back on your feet and getting things done around the house within a day or two. We recommend taking a break from aerobic activities for two weeks, while avoiding all weight lifting for one month. You can expect your mini facelift results to last for 3-5 years. This is, of course, dependent upon your age, skin elasticity, and lifestyle habits. If you are looking for a facial refresh, the mini facelift is a fantastic option!